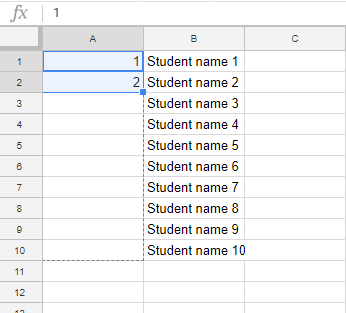 This article shows how users can print a roster with numbers added to students through Excel. From the Roster Printout, download your roster using the Roster (.xls) link. In Excel, right-click on the first column and choose Insert. 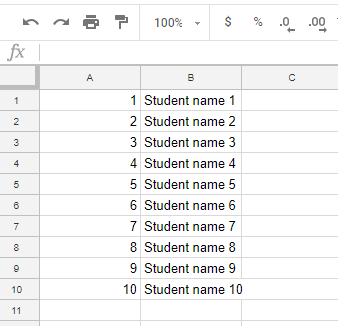 This inserts a new column to the left of the First Name column. Type 1 in the empty cell next to the first student's name. Type 2 in the empty cell next to the second student's name. Select the two cells, then hover over the bottom right corner of the selected cells until the cursor changes to a +. Drag with the left mouse button down the column until you get to the last student row. When the mouse is released, all students will have respective numbers and the roster is now ready for printing.